Some people when they’re younger have a feeling of invincibility and don’t take care of themselves as they should. Maybe they eat too much junk food, spend little time working out or shortchange their sleep. Fit in fitness daily. 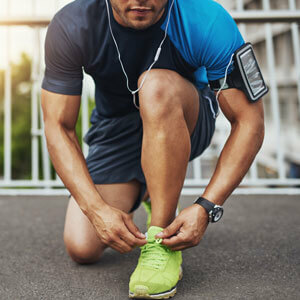 Whether you enjoy walking, cycling, running, golfing or doing CrossFit, engaging in at least 30 minutes of exercise a day can help keep your body strong and your mind sharp. Strive to eat a plant-based diet. According to research, this whole foods diet could reduce inflammation, reverse major diseases and improve overall health. Get sufficient sleep. When you sleep, your body heals. That’s why it’s vital to get 7 to 8 hours of high-quality sleep a night. Stop smoking. When you quit smoking, you can experience many positive health changes such as lowered blood pressure, improved circulation and so many more. Adopt a positive mental attitude. By having a positive attitude, you can better cope with stress and avoid mental distress as well. Starting each day by being grateful is also good for your health. Get adjusted. A healthy nervous system can allow you to experience better overall health as well. Making chiropractic a part of your wellness regimen is always a good idea! Even making small changes now can pay off in the form of big health dividends down the road. And by taking control of your health now, you could avoid chronic and serious health conditions such as diabetes, cancer and heart disease. We want to help you live to your potential and enjoy not only a long life but a higher quality of life so you can do all of the things you want, free from pain and sickness.